The USS Nautilus in Portland harbour in 1958. I think this was her first visit to the U.K. Photo sent in by © William Marsh. The USS Nautilus (SSN-571) was the world's first operational nuclear-powered submarine. 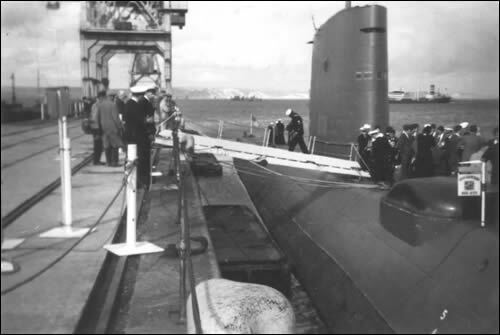 Launched on the 21st January 1954, this was the first submarine to complete a submerged journey to the North Pole on the 3rd August 1958.